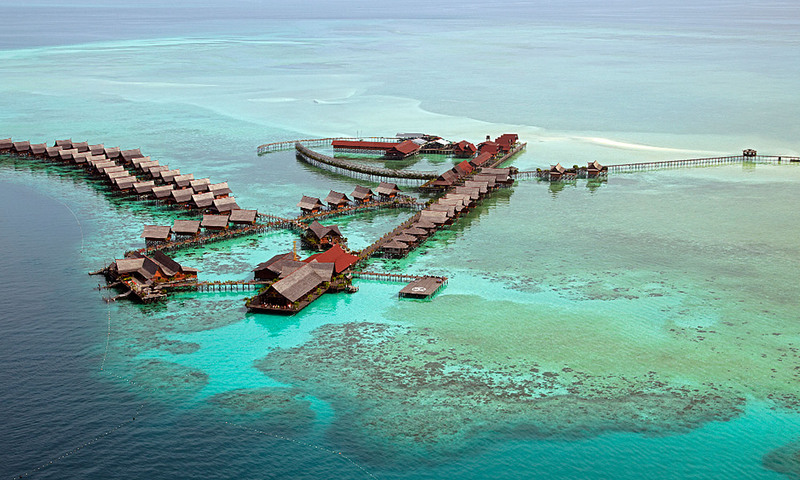 Like something out of the film Waterworld, Kapalai Dive Resort is built on stilts on a reef amongst some of the world's most stunning scuba diving in the Celebes Sea. For those wanting to escape the world, sitting on a deck chair watching the sun go down over the mainland on the distant horizon is the perfect tonic. Rooms are more than comfortable – obviously all over water – with well-designed private decks for some serious après-dive chilling. The centre of the main dining room has an open void through to the reef below, and it's not uncommon to see live versions of your dinner swimming past. The resort is a web of rich wood walkways connecting the rooms with dining areas, the dive department and even a beach rotunda; the perfect spot for a cool sundowner. This might be predominantly a divers' resort, but there is plenty to do for non-divers, with a white-sand beach materialising at low tide and excellent snorkelling from any part of the resort. For the divers, you're only a 20-minute boat ride to Sipadan, one of the world's most stunning dive sites. No mosquitos – it’s a rarity! Kapalai Resort is a 45-minute boat ride from Semporna. For three days/two nights it’s US$801 for two divers, and US$643 for two non-divers.